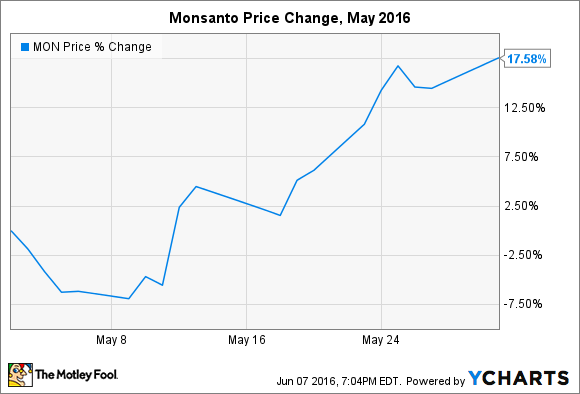 Monsanto Shares Rose 17.6% in May, but Can It Hold? After treading water for a failed acquisition attempt for much of 2015, Monsanto jumped after being courted by Bayer last month. What: Shares of agricultural technology leader Monsanto (NYSE:MON) rose nearly 18% in May after German conglomerate Bayer AG made an initial buyout offer of $40 billion, then followed that up with a monstrous $62 billion bid that would have netted investors $122 per share. Monsanto rejected both offers. So what: Talks of a potential merger are hardly surprising at this point. Since late 2014, low commodity prices, specifically grain and chemical prices, have led to increased volatility and uncertainty for seed and agrochemical companies, which have responded with knee-jerk merger agreements. The Dow Chemical Company and DuPont announced a $130 billion merger in late 2015, while Syngenta agreed to merge with ChemChina earlier this year. Analysts and some investors urged Monsanto to follow the trend, but after failing to court Syngenta throughout 2015 and the first quarter of 2016, management decided to focus on internal R&D projects and growth prospects. While the second offer was significantly higher than the first, Bayer was really stretching the limits of its balance sheet. German investors didn't react kindly to size of the deal, which would have to be financed almost entirely with debt. Moreover, a merger would create a company with 30% market share of the agricultural seed market. That likely wouldn't pass by regulators and antitrust laws, forcing tough decisions about spinouts and divestments -- as Dow and DuPont investors have learned. Bayer attempted to call Monsanto's bluff with a $40 billion buyout offer, but management didn't blink. That was good news for investors focused on the long-term growth prospects, especially considering the tremendous value in R&D projects leaving the pipeline for real-world markets in the next few years. Bayer followed with a $62 billion bid, which Monsanto considered but ultimately turned away. Now what: Investors can be confident that Monsanto -- and its near-term and long-term growth prospects -- is worth considerably more than $40 billion. Saying "no" to $62 billion for $122 per share may be more difficult, but I think the company can still achieve a market valuation at least that high through its own efforts within the next few years. While peers are stuck playing with agrochemicals, Monsanto will be launching innovative products that reduce agricultural inputs and place it in a class of its own. Of course, if current headwinds persist, I wouldn't be surprised if the stock gave back at least some of its gains in the near term.